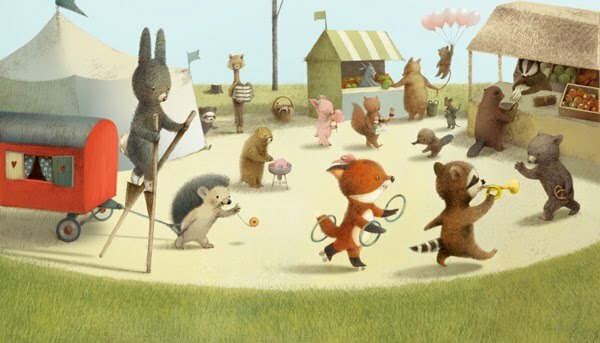 Renata Liwska is my favorite new(er) picture book artist, joining the ranks of Sophie Blackall and Emily Gravett. I first discovered her when the instant classic, The Quiet Book, came out in 2010. 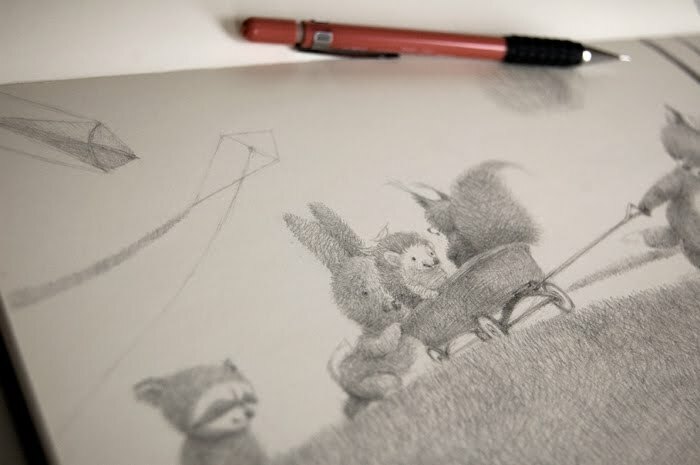 I quickly grabbed the first book she illustrated and authored on her own, Little Panda and spend many hours pouring over the illustrations and works-in-progress she shares on her blog, Pandas and Such. I am so excited that there are TWO books from Liwska in 2011 and the year isn't even half over! The Loud Book!, follow up to The Quiet Book, came out at the same time as Liwska's second solo work, Red Wagon. When Lucy asks her mother for permission to play with her new red wagon, she has no idea her mother will send her off to the market to do a chore. What follows is Lucy's trek to the market, friends in tow, and the many imaginary adventures they have on their way to buy vegetables. 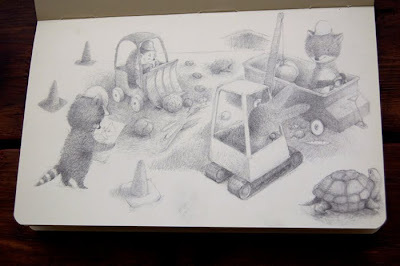 Liwska's text is short and sweet and the illustrations, most of which are two page spreads, tell the real story as the red wagon goes from wagon to caravan to rocket to construction truck and more. By the time Lucy returns home she is too tired to play with her wagon and instead curls up inside it and falls asleep with a good book, Nikolai the Bear, the first book Liwska illustrated! If you observe Liwska's illustrations very closely, you will notice that she likes to have her animals reading her other books within a book. Here are two preliminary sketches for Red Wagon. 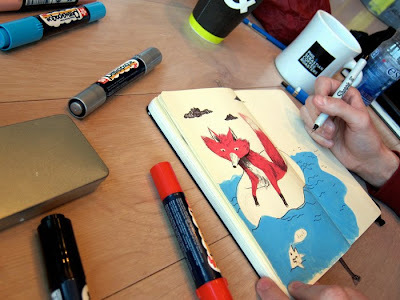 And here is a photo of Liwska sketching in one of her many Moleskine books.